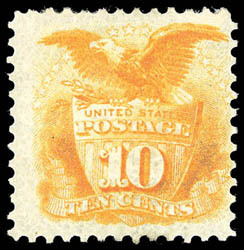 1869 (1875 Re-issue), 10¢ yellow, part o.g., wide margins and rich color, tiny tear at top left, Fine appearance; with 2015 P.F. certificate. A link back to Sale 67 - Lot 1950, along with its description, will be appended to your message.